Before we give our commentary on this vanity license plate, let us start by saying that there is absolutely nothing wrong with driving a Nissan. We even have a handful of excellent coworkers who navigate the parking lot and city roads in Nissans. 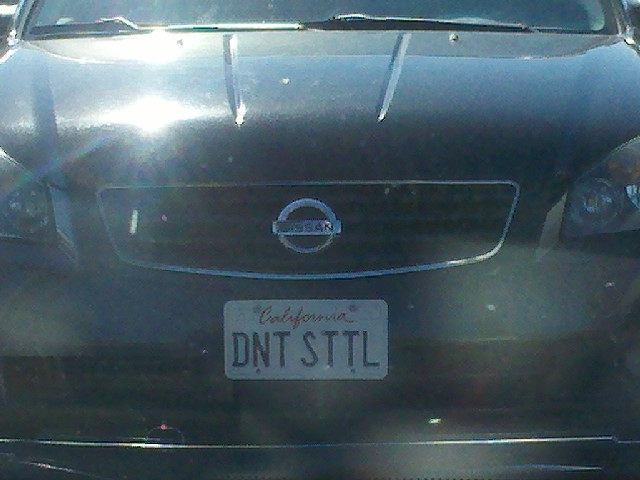 However, if you’re going to put a “Don’t Settle” license plate on your ride…it best be on something a bit more challenging to acquire than a Nissan. Honestly, when you were a kid, did you dream of having a Nissan? Or were you thinking of zooming around in a Corvette, Lambo, Ferrari or Aston Martin? Yeah, we thought so! ~ by ASSMAN on October 11, 2010.